LAST MONTH, BEEF farmers started a 24-hour blockade of meat plants across the country. Since then there has been a back-and-forth between the two sides, as farmers call for better payment for their beef and processors claim this would not be sustainable. Farmers are currently holding a 48-hour protest at meat factories around the country, after talks aimed at reaching a resolution ended in failure on Friday. So, what’s it all really about? Essentially, farmers want to be paid more for their meat and factories don’t want to do this. Beef farmers in the UK are paid €350 more for their meat than farmers in Ireland. They want the factories to reflect the improved market situation in the prices they pay to farmers. On the other side, we have the meat factories, who say prices across the EU have been reduced. EU beef consumption has fallen by 700,000 tonnes since 2010 and we produced 15% more beef this year. The Meat Industry Ireland (MII), said this means “we are selling an additional 75,000 tonnes of beef into a market where consumption has fallen dramatically during the economic recession”. They’ve also said that cattle prices are strengthening anyway, increasing from 92% of the EU average to 100%, so the action taken by farmers is “unnecessary and questionable”. MII claims the continued focus on comparing Irish prices with that of the R grade steers in the UK is “over-simplistic, inappropriate and wholly misleading”. The independent Dowling report (June 2014) into the beef sector confirmed that price comparisons, simply on the basis of the R3 steer, were not appropriate as the “level of access to the premium retail market in the UK is not the same for both sides”. Using more market relevant benchmarks indicates that Irish beef prices are very much in line with comparable EU prices. Last month’s 24-hour protest brought factories across the country to a standstill with 10,000 farmers turning up to express their anger and frustration. The Irish Farmers’ Association (IFA) says our main markets have now recovered and farmers are no long prepared to tolerate loss-making prices. MII (obviously) condemned the action, saying it would damage Ireland’s reputation with customers as well as disrupting day-to-day business in the ground. The industry also said the blockade would not impact EU beef market prices. However it did launch the Minister for Agriculture into action. 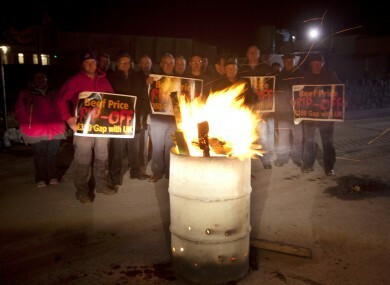 Having already convened Beef Forum meetings in April and June, Coveney had another meeting where beef was the hot topic. He called all stakeholders, which included processors and the main representative associations – the IFA, the ICSA, the ICMSA and Mocra na Ferime – to the table for meetings on the issue. This was the first time that a roundtable also included buyers from Tesco and McDonalds, who together are the largest buyers of beef in Ireland. Coveney secured an agreement between farmers and processors to enter into intensive discussions, under an independent chair. I am fully aware that beef farmers have had a challenging year having seen reduced prices for their animals compared to this time last year. I welcome the honest exchange of views between stakeholders today. It was agreed that another meeting would be convened on 12 November, to get an update on progress made in negotiations between the two sides. Not quite.The IFA’s executive council held an emergency meeting in Dublin at the start of this month to consider its next move. The council decided to sanction further action against beef factories unless there is movement on prices immediately . Talks broke down and the 48-hour blockade of meat factories began yesterday at 3pm. Thousands of beef farmers across the country are taking part in the protest. Email “Explainer: What's the beef between farmers and meat factories?”. Feedback on “Explainer: What's the beef between farmers and meat factories?”.